Led by women, for women. PRG is proud to partner with Sara Friedman, founder of Freedwoman Retreats, to create a day of outdoor climbing exclusively for women. 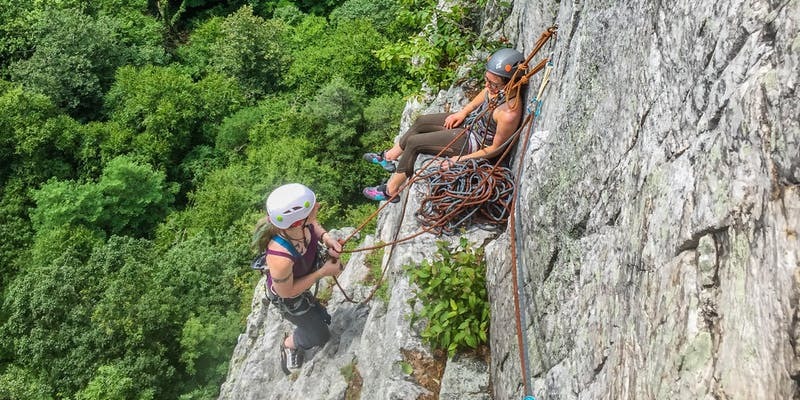 Join your fellow females for a morning of outdoor rock climbing and connection! No experience needed! All belayers and professional guide are included. All rental gear is included. No Man’s Land Film Festival is May 11th! Un-defining what it means to be a woman in adventure and sport through film. Fine Print: Registration closes April 24th. All participants must sign a waiver. Questions? Email Lauren at lcaporizo@philarockgym.com. All participants will need to provide their own transportation to Ralph Stover State Park. We will meet in the High Rocks Vista Parking Area. Look for people standing around after you park! That will be us! Bonus FYI: There is a port-o-potty in the parking lot should you need one. Comfortable athletic clothing (bring layers that will suit the weather!) and good shoes to hike in. The hike from the parking lot to the climbing area is very short, but a bit rocky, so sturdy, closed-toe shoes are the best option. Bring plenty of water and snacks (and a small day pack to carry your items in). There is a port-o-potty in the parking lot if needed. Feel free to BYOTP and hand sanitizer. Cancellations made more than one week prior to the event date may be eligible for a refund. Cancellations made within one week of the event date are not eligible for a refund, but may be eligible for a credit.